Corresponds to EN 1677‑1 with higher load capacity. For pewag Connex and welded System. For shortening and for slings that must not tighten. 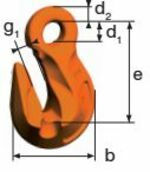 First grab hook in grade 10 quality on the market. Reduction of load capacity not required thanks to 4-fold safety. For G8 slings not attachable with Unilock U.